0 0 processing, please wait. £5,400,000 (Aus$ 9,848,649 / ZAR 98,573,095). One UK Lottery ticket is all it takes and we are paying out BIG winners every draw! So join the 1 million weekly winners and have a go because "You've just got to be in it, to win it!" Are you receiving important 'Ticket purchase confirmation' and 'Info' e-mails for your UK Lottery ticket entry form us? They could be getting caught up in your ISP's spam filters! CLICK HERE for more information. We keep the UK lottery results for each Wednesday and Saturday nights draw, directly from the UK National Lottery so if you want to view past UK lottery results, choose the UK Lottery Results Main menu item at the top of the page. New player bonus! UK Lottery Live will add 25% to your first deposit. See Promotions for more info. BEWARE of Lottery scams! (UK Lottery, also know as UK National Lottery and uk lotto) Click here for more info! You can also go to http://www.scamslive.com/ and have a look around this awesome site that is dedicated to STOPPING SCAMS! Uklotterylive.com makes it possible for you to play the UK National Lottery, also known as the uk lottery and the uk lotto and join the 1 million weekly winners of one of the world’s richest TAX FREE, PAID IN ONE LUMP SUM lotteries! All you have to do to enter the UK Lottery is to play your favourite numbers on our 'PLAY BOARD (above), 'REGISTER' a Player Account, and we will, safely and securely, purchase as many tickets as you like, wherever you are in the world! Northern Irish couple start 2019 with a £114.9 Million jackpot win! The MegaMillions Jackpot is now 1.6 Billion! Euromillions has changed their configuration to what it believes is better customer experience. 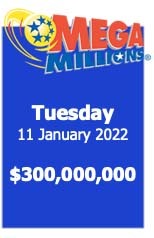 Tomorrow is one of the highest jackpots on offer for the Euromillions. This Friday and Saturday, the total upcoming jackpots stands at £333 million. Incredibly inspirational. Young couple win £45million Euromillions jackpot. UKLotteryLive and WorldLotteryLive are neither associated with The National Lottery or endorsed by Camelot Plc or the National Lottery Commission.